Capt. Wesley B. Albritton, Fort Irwin Medical Activity Company Commander, is shown with his spouse, Victoria Albritton, and daughters at Fort Irwin’s Daddy Daughter Dance March 8. Albritton was the guest speaker at the event. FORT IRWIN, Calif. — Young girls were whisked away for “A Night in Paris” at the Daddy Daughter Dance at Fort Irwin’s Sandy Basin Community Center March 8. 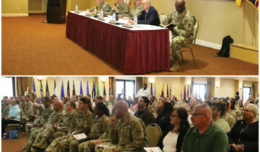 Several home-based businesses and community organizations joined the U.S. Army’s Medical Activity Family Readiness Group to put together an evening of father-daughter bonding time. 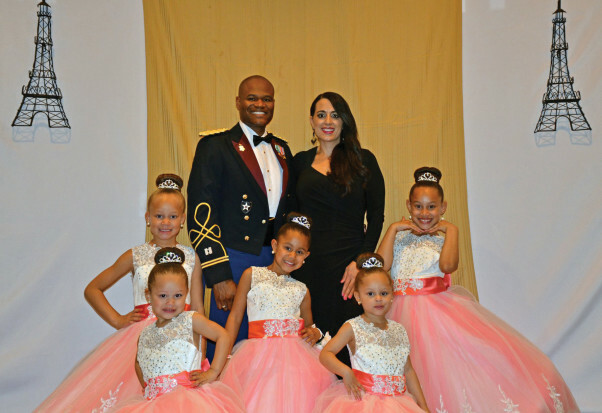 MEDDAC FRG coordinated Fort Irwin’s Daddy Daughter Dance to engage the community in an effort to build resilience. 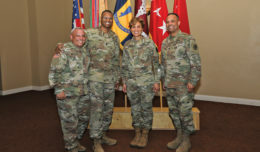 The Family Readiness Group, formerly known as the Family Support Group (FSG), is a concept that had early roots among Army families, who banded together during times of war or tours overseas to provide information, moral support and social outlets to their members. At the dance, dads in dress uniform escorted their daughters through raised sabers into a room alluding to an evening in Paris. Tables and chairs were draped in black cloth with golden ribbons wrapped around the chairs. The walls were lined with food, drinks, desserts and photo booths. In the center of the room was a wooden dance floor. The young girls, wearing dresses befitting a princess, ran jubilantly around the room enjoying the music, food and desserts. Dads twirled and dipped the little ladies in the center of the room when not stopping to take photos at every opportunity to capture precious memories. The guest speaker at the event was Capt. 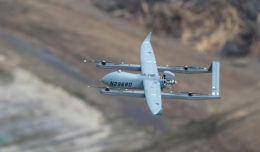 Wesley B. Albritton, Fort Irwin’s MEDDAC Company Commander and the father of six children, five of whom are girls. Albritton gave an empowering speech to the young ladies as they surrounded him on the dance floor, chanting ‘yes’ in reverence. The event was well received by the community. The MEDDAC FRG has every intention to host another Daddy Daughter Dance next year. To stay up-to-date with what the Medical Activity is doing, visit https://twitter.com/FortIrwinMEDDAC.